The job will be twice as difficult if you simply start randomly putting items away. Create a plan based on how you like to decorate, whether you prefer going by room or by like items. When you begin packing, set aside a box and mark it, "Open Me First." Use it to hold essential items that will create the basic holiday look so you don't have to search for them. It also saves time if you decide to keep decorating at a minimum. How many times have you made return trips to the store to either buy more decorations or return product you've overbought? 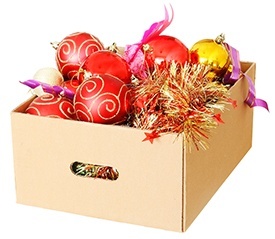 As you pack up the decorations, list each item so you have an accurate idea of what you need next year. 4. Eliminate Holiday Light "Spaghetti"
Untangling holiday lights is probably the most frustrating and time-consuming part of decorating. An old coffee can makes a handy caddy for those unwieldy cords. Cut a hole in the plastic lid, insert the plug end and wrap the rest of the string around the outside of the can. Store extra bulbs and extension cords inside the can. Do you have old decorations taking up valuable space because you "might" use them again sometime? If you haven't used it in a year or more, toss it. Place leftover rolls inside a garment bag and hang in a closet. Use a large plastic container that slides beneath a bed. Take advantage of unused vertical space with an over-the-door holder. Repurpose empty egg crates as green ornament holders. Unpacking will proceed more smoothly if you can see at a glance which items are in which boxes. Plastic storage containers are the easiest solution. If you use cardboard boxes or other containers with less visibility, label them clearly on the side so you can see even when the boxes are stacked. You might want to consider a color-coded system where you record the key with your inventory list. Do you have an ornament or decoration that holds special memories? Tell us about it in the comments!